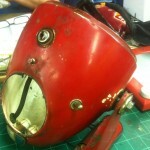 The original headlight was too far gone to be able to repair. 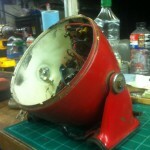 I was able to require an original headlight from a friend who owns MPH Auto in Houston Texas. 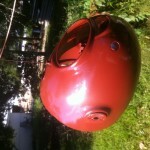 He used that bike as a parts bike that he previously restored. The headlight contained two added on switches for some reason. Inspecting the wiring it seems to be a function to control all lights individually. The switches can be seen in some of the photos. I stripped down the older bad paint job, which i found out that the original colour was dover white. I then created a filler plate and welded in the areas where the switches were located. 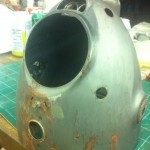 I also removed some rusted areas and filled them in with metal/weld. I then grind-ed and smoothed out the metal for painting.